In our house we love love love peanut butter. And while my boys love it on sliced apples or straight from a spoon. I love using it to create super-delicious sauces. And this is one of those rare occasions where I prefer smooth peanut butter. But crunchy will work too! 1. Cut chicken breasts in half lengthwise so they’ll cook quicker. Place chicken in a medium saucepan large enough to fit them in a single layer. Cover with cold salted water and bring to a gentle simmer. Set your timer and simmer for 8-10 minutes or until chicken is cooked through – 73C (165F) when tested with a meat thermometer. Or when no longer pink in the middle if you cut through one to test. 2. Remove chicken from the pot with tongs and place in a clean bowl. Slice broccoli stems finely and chop florettes into bite sized pieces. Bring chicken cooking water back to the boil. Add broccoli and simmer, covered for 5 minutes or until broccoli is no longer super crunchy. Drain broccoli and divide between two bowls. 3. Using clean fingers or two forks, shred cooled chicken into bite sized chunks and toss in with the broccoli. 4. Stir together peanut butter, lime, water and soy sauce until you have a smooth sauce. Taste and season with more soy or lime if needed and dollop sauce on bowls. If you’d prefer a thinner sauce add a little more water. 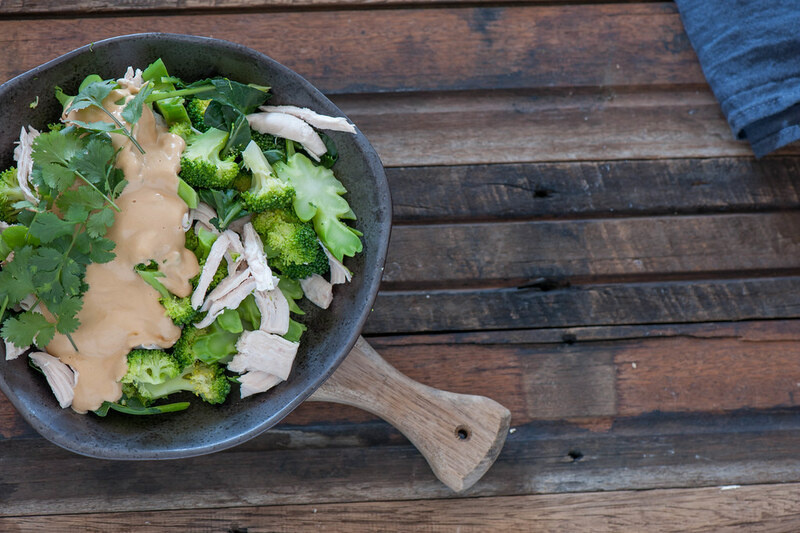 Drizzle sauce over the chicken and broccoli. Top with coriander leaves (if using). WINE MATCH: A cold beer or glass of crisp white wine. hot! – add 1-2 small fresh red chillies like Thai Birds eye or serrano, finely chopped to the sauce. vegetarian – use boiled or poached eggs, pan fried tofu or cooked chickpeas instead of the chicken. more substantial (low carb) – use more chicken or serve with roasted peanuts. more veg / different veg – feel free to add any raw or cooked chopped veg like steamed beans, bok choy, capsicum (bell peppers), carrots, cucumber are all good. no lime – sub in lemon juice or rice vinegar. nut-free – replace peanut butter with tahini (sesame seed paste). 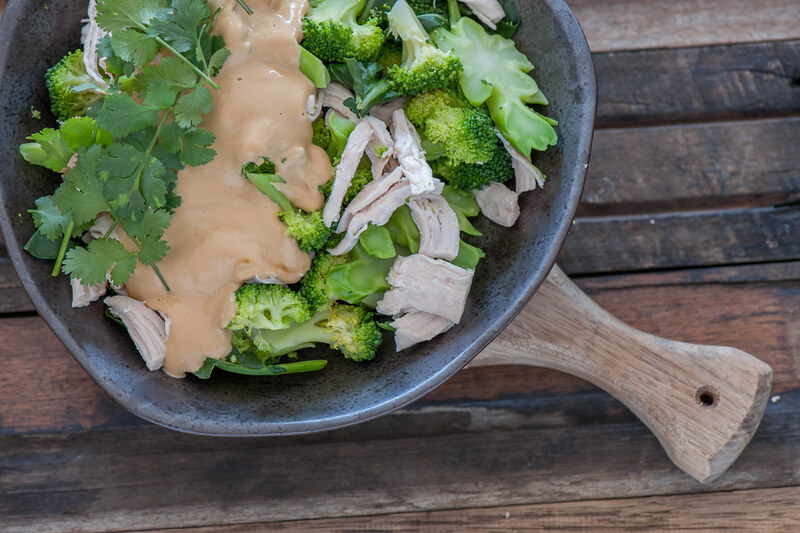 different sauce – use 4 tablespoons each peanut butter, yoghurt and lime juice. My Irishman liked this version best. chicken breast fillets – freeze it. smooth peanut butter / soy sauce – keep it in the pantry.